The Health Professions Network's 2017 Chicago Association Summit convened executives and representatives from professional organizations of non-physician health professions to discuss the challenges facing associations and the health care industry. Via teleconference, Greg Morrison of the American Society of Radiologic Technologists led the group in a fascinating look at the grand scale of what change in both the association and the health care industry may bring to its organizations and professionals. The group continued the discussion by sharing outlooks—the trends and challenges groups are monitoring and facing, as well as outlining potential collaborative solutions to these shared challenges. Common themes, topics and solutions shaped this report. On one level, I hope this blog affords readers an opportunity to provide their feedback on this report—what’s missing? What do you see as the primary drivers of change in health care, for professionals, or for professional associations? What should associations be striving to achieve for their members? Join HPN to stay current with the changing landscape. The Health Professions Network is a nationwide collaborative group of organizations representing leading health professions associations, accrediting agencies, and educational institutions, as well as federal and state workforce analysts and licensing and certification bodies. As the only organization of its kind, HPN is uniquely equipped to support your organization. 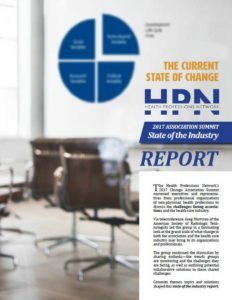 Our 2017 Association Summit and State of the Industry report demonstrates our continuing commitment to supporting associations leaders and, ultimately, all the health professionals our members represent and promote. HPN is positioned to view trends in health care from the widest range of perspectives. HPN continues to expand communications to bring members more valuable updates and insights. HPN membership will keep you up-to-speed on the accelerating changes in health care, and our meetings continue to deliver high quality speakers doing thought-leading work in the industry, at the cutting edge of change. HPN’s members combine a great deal of experience and expertise in association leadership, and these members are a resource for your professional and organizational development. With organizations at all levels and in all stages of development, leaders have a chance to learn from each other—what works and what doesn’t in terms of supporting members, students, and credentialed professionals alike. HPN continues to convene a wider range of both member and non-member groups and influencers in healthcare initiatives and collaboratives, which offer unique opportunities for networking. Your own initiatives and advocacy efforts can be enhanced through collaboration and building on each others’ efforts—and together, we ensure that the voice of non-physician health professionals is heard.